South Africa's Parliament elected Cyril Ramaphosa to be the country's next leader Thursday. Cyril Ramaphosa is officially South Africa's new president. He was elected Thursday by the country's Parliament. No other candidates were nominated. This election comes after South Africa's previous president, Jacob Zuma, said he was stepping down Wednesday. 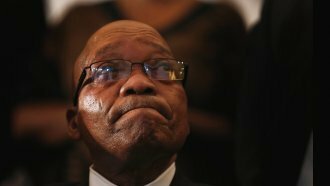 Zuma faced scrutiny for his alleged role in a number of corruption scandals, but he's never been convicted. The African National Congress, his own party, voted to replace him back in December and officially recalled Zuma earlier this week. Ramaphosa became the interim president when Zuma resigned. Ramaphosa is reportedly scheduled to make his first state of the nation speech Friday.